Accommodates cording up to 3/16" in diameter. 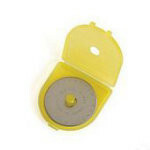 Designed for right or left handed use and works best with any 45mm or 60mm rotary cutter. Complete instructions for making perfect piping and using the tool included. The tool is 11.5in in length so users are able to trim 400in of piping in less than 20 min! Adele Tips: Cut fabric on the bias for best results. Use a sharp blade. As you trim pull the untrimmed parts into position then trim again as you pull. Move needle position closer to cording when you're sewing through piping the last time. It'll hide your previous stitches.